Choosing to build a composite deck isn’t a decision to be made lightly. A high quality deck adds to the value of your home, and ultimately adds to the happiness of your household. As aesthetics in materials increase, composite decks are becoming more popular. By using the highest quality materials, such as Trex, Fiberon, and TimberTech, we can ensure a deck that will continue to provide years of fun family enjoyment without the headache of high maintenance. Your deck must do more than complement your home; it should also complement your lifestyle. Here at Texas Decks, we enjoy building decks that stand the test of time and improve the visual appeal and functionality of your home. Your home doesn’t have to be multiple stories to implement an amazingly elaborate composite deck. Be creative in your design. Call us to discuss ideas and to find out if your design is feasible. We may be able to give you ideas you didn’t realize were possible. By using composite decking you can replace your old porch and truly personalize your front or back entryway. Consider decorating your new deck to match your favorite vacation spot and always feel a sense of peacefulness when you step out onto your deck. We specialize not only in composite decks but also in the installation of hardscapes, portable and in-ground spas, and outdoor kitchens as well. Scope out your property while planning your deck design; the objective is to find your favorite view. Use that part of the deck as your own private overlook, even if it only provides a great view of your favorite part of the yard, or those pretty flowers you planted last year. This area should become a primary sitting area for you. Privacy is often a big concern in heavily populated residential areas. Consider building a privacy wall on your deck if you’re concerned with your privacy. Walls are the perfect solution around a spa or a sunbathing area. Find a great focal point. Many people who have a difficult time designing their own deck find it useful to choose a focal point. For example: you’re sure you want a fire pit but you aren’t sure how you want to implement it. Find some ideas online, and let your imagination run with it. Call us, we’ll help. A typical composite deck is constructed using high quality materials. 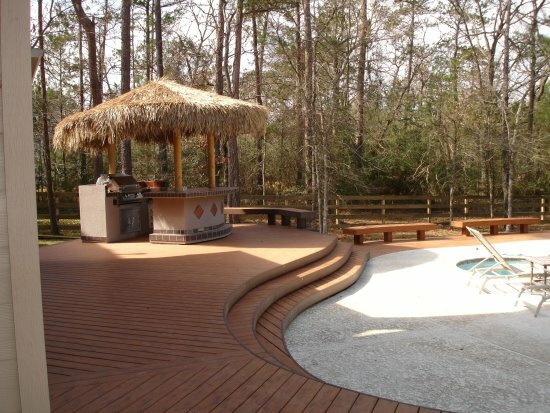 Trex, Fiberon and TimberTech are the materials of choice here at Texas Decks. They require regular maintenance like any other deck, and they carry a 20 to 25 year warranty. The composite decking materials we use, Trex, Fiberon and TimberTech are made from reclaimed items such as plastic, high density polyethylene, and wood. These materials would otherwise go unused in landfills. Using these materials to create beautiful composite decks makes us feel like we’re doing our part to help the environment. At Texas Decks, I supervise my crew every day. Even though I won’t be visible to you every day of the project I’m still available to answer any questions you may have. You’ll never have to deal with a middle man because there isn’t one. I take great pride in the work I do, and will never sacrifice quality for quantity. We know choosing the right contractor to install your composite deck is tough, but we want to make it easy for you. Why don’t you take a look at some of the composite decks we have previously built, check out our gallery of past projects here. If you’d like to see what some of our clients have to say about us, click here. If you would like to speak to us directly, call 281.960.2061 or contact us through our website by clicking here.